SHOWING respect for people who lost their lives fighting to “save our freedom” is what Anzac Day is all about for Vietnam veteran Kevin Emberson. The Joondalup RSL vice-president said the day was about remembering fallen service people and showing support for their families left behind. 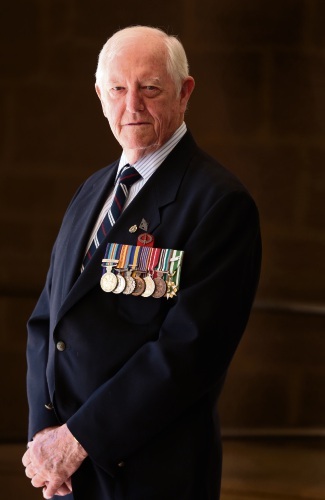 Mr Emberson (78) enlisted in the National Service in 1957 before serving in the army for 21 years, including in Vietnam with the third battalion Royal Australian Regiment (RAR). He spent 12 months there as the pay sergeant from 1967 during the battle of Coral-Balmoral where many of his friends were injured and lost their lives. The Woodvale resident said the loss of life during war was a “dreadful shame” and a “terrible waste of young life” but was often a reality of serving “Queen and country”. “We join the services for our country and many pay the ultimate price by losing their lives to save our freedom, to keep our freedom, in this wonderful country,” he said. “Anzac Day is a day to remember all those people who have fallen during war and who have fallen from war causes since coming home. Mr Emberson, who also served in Singapore, Malaysia and Australia, retired from the army as a Warrant Officer I Regimental Sergeant Major before joining the reserve in 1981. He said being part of the services for about three decades was something he was exceptionally proud of and that wearing his medals on Anzac Day was an honour. Mr Emberson, who will be representing Joondalup RSL at the Anzac Day Dawn Service at Central Park, said seeing the sea of people showing their respect humbled him.